The current exhibition at the Ken Stradling Collection, 48 Park Row, Bristol. On until 9 December. A selection of work fom ‘Of Brush and Clay’ including pieces by Nicholas Vergette, William Newland, Sam Haile and Margaret Hine. An exhibition of ceramics by Bill Newland, Margaret Hine and Nicholas Vergette together with Sam Haile celebrating an interesting group of mid-century artists whose interest in contemporary art and in painting set them apart. The show combines pieces from the Ken Stradling Collection with around 30 examples of Newland and Hine’s work on loan from their family. Margaret Howell’s gallery in Wigmore St, London is currently showing a selection of more than 50 pieces from the Ken Stradling Collection chosen and curated by Margaret herself. The show included pieces from across the collection but central is a selection of furniture designed by Marcel Breuer for the Bristol house of furniture manufacturer Crofton Gane in 1935. 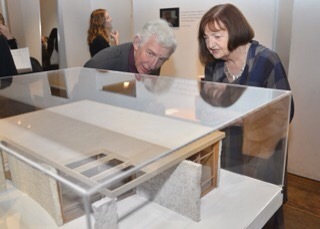 Christine Dove, Chairperson of the Society of Designer Craftsmen examines a model of the 1936 Gane Pavillion. Margaret Howell’s News page has a full description of the show and a video conversation between Margaret Howell and Ken Stradling. Chlöe Monks is a 2nd year student on the BA (Hons) Ceramics course at Cardiff School of Art and Design. She has been very much involved with the Ken Stradling Collection this year as a volunteer. She is volunteering with the Crafts Council and the National Museum of Wales as well! Amongst all the other things she has to do, Chlöe has found the time to post on her blog about her experiences at the collection – Chlöe Monks – Ken Stradling Collection. 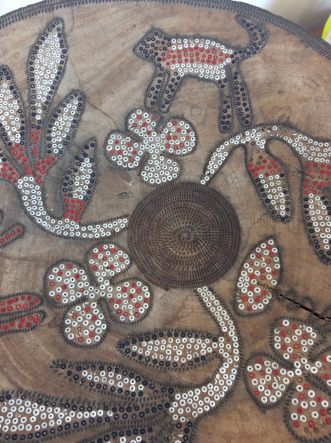 Whilst with us she has been researching a Kenyan carved wooden stool which is one of a number of ethnographic and folk art objects that Ken has collected over the years. For her thoughts on it see her post African Stool. Chlöe is volunteering at the National Museum of Wales as a tour guide for their major contemporary ceramics exhibition ‘Fragile’ which is on until October. 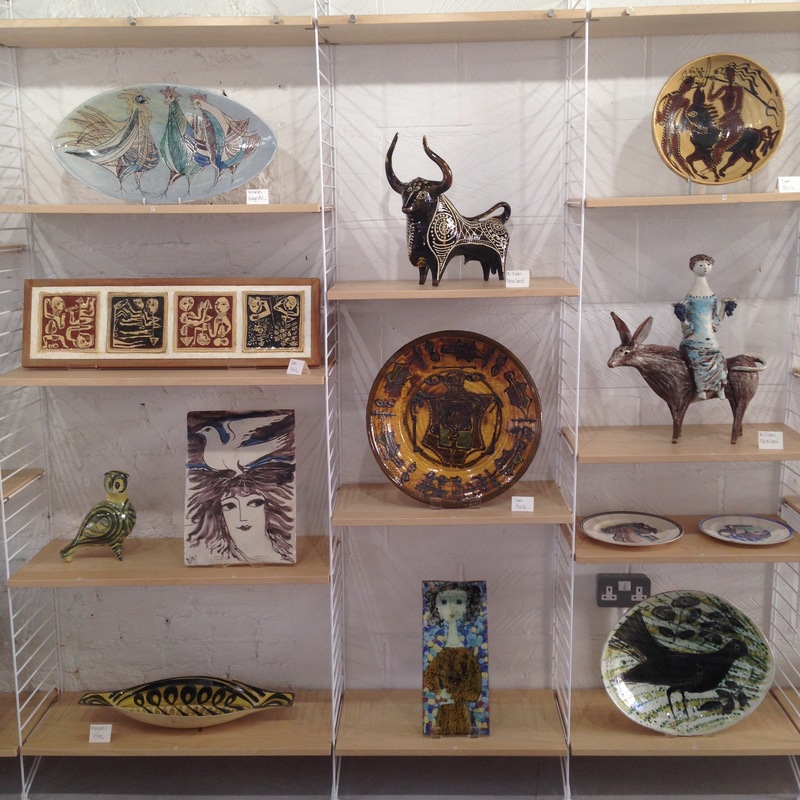 The exhibition showcases a range of new work by artists and makers working with clay. These include installations by Phoebe Cummings, Keith Harrison and Clare Twomey. Expect to see things get broken… For more information about this show go to the . 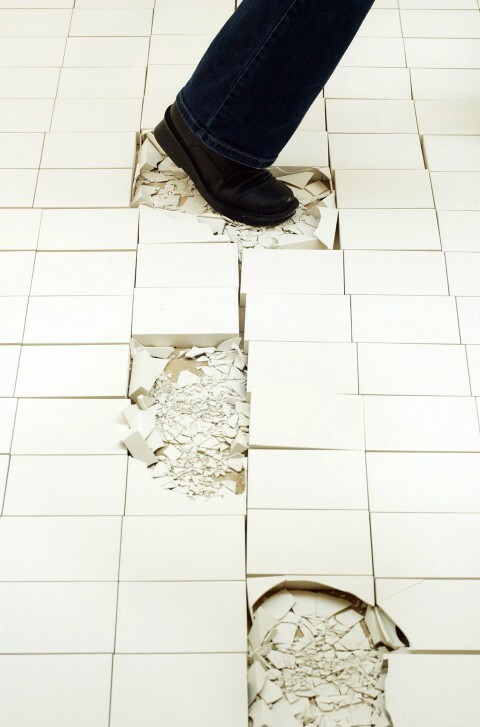 Chlöe is volunteering at the National Museum of Wales as a tour guide for their major contemporary ceramics exhibition ‘Fragile’ which is on until October. 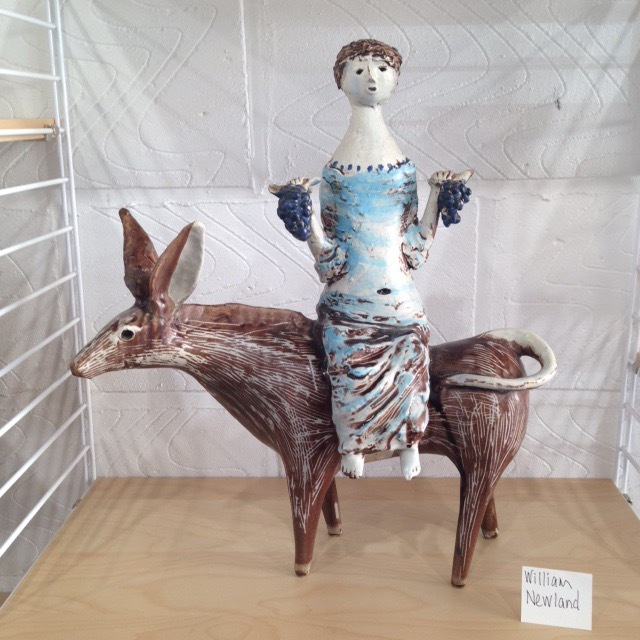 The exhibition showcases a range of new work by artists and makers working with clay. These include installations by Phoebe Cummings, Keith Harrison and Clare Twomey. Expect to see things get broken… For more information about this show see the National Museum of Wales website. 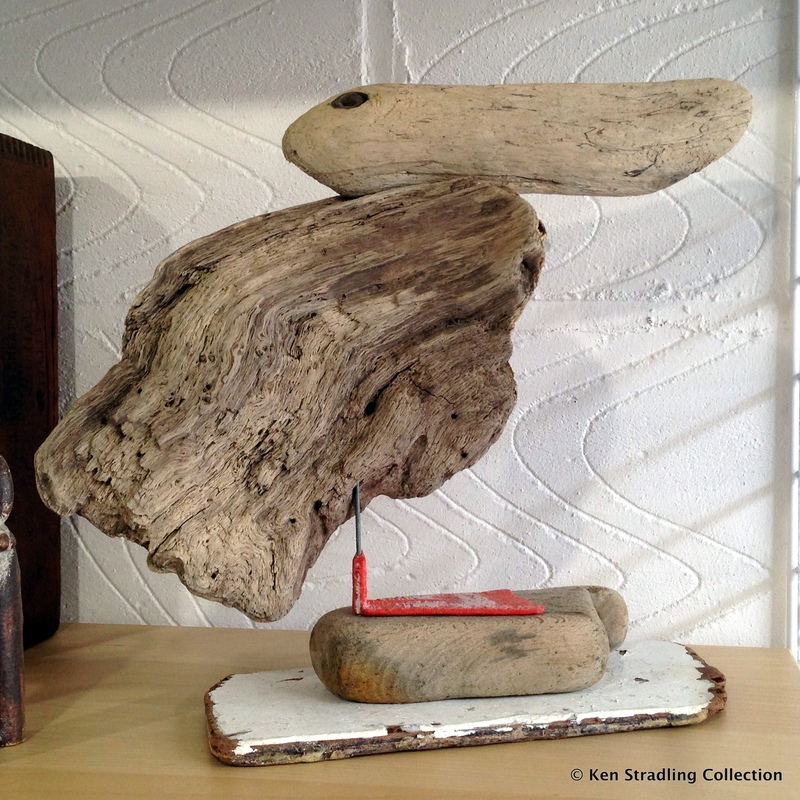 Amongst the artists represented in the current show at the Ken Stradling Collection is the driftwood sculptor Sid Burnard. Sid is a longtime friend of Ken’s and says he cut his teeth as a maker whilst working for him at the Bristol Guild years ago. 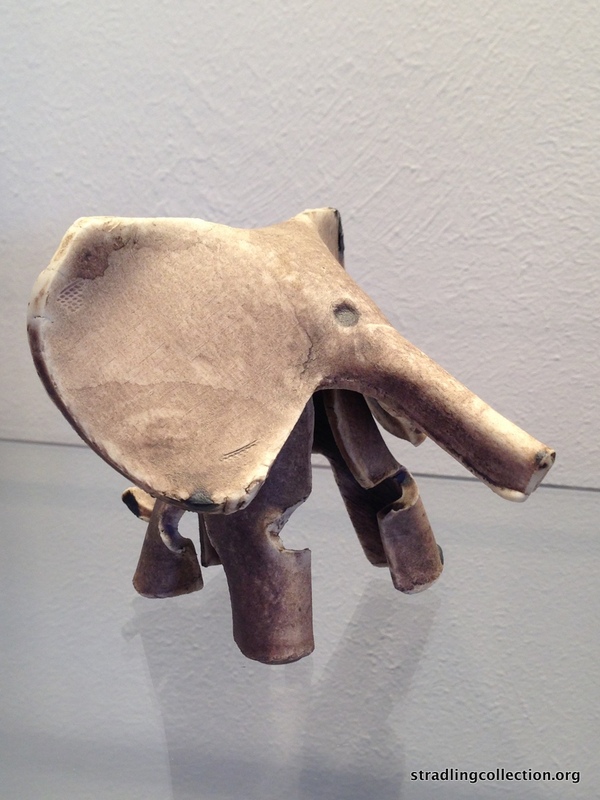 Sid has kindly lent two pieces – a pelican and a pig – from the Goldmark Gallery. The pelican is a delightful piece that quivers gently on its orange plastic foot if you move it or a breeze catches it. It is typical of the kind of playful object that Ken enjoys and sits watching the door from the top shelf in the gallery. Below is a 32 minute film made by Goldmark to celebrate Sid’s work. Well worth watching. Animal Magic – an Exhibition of Creatures from the Collection opens today at the collection’s Design Study Centre in Park Row, Bristol. The new show at the Ken Stradling Collection showcases around 90 pieces which reflect Ken’s sense of fun in the form of animals. Every kind of medium is covered from steel to paper and from Wedgwood Coronation souvenir mugs to cheerful Danish wooden toys by Kai Bojesen. 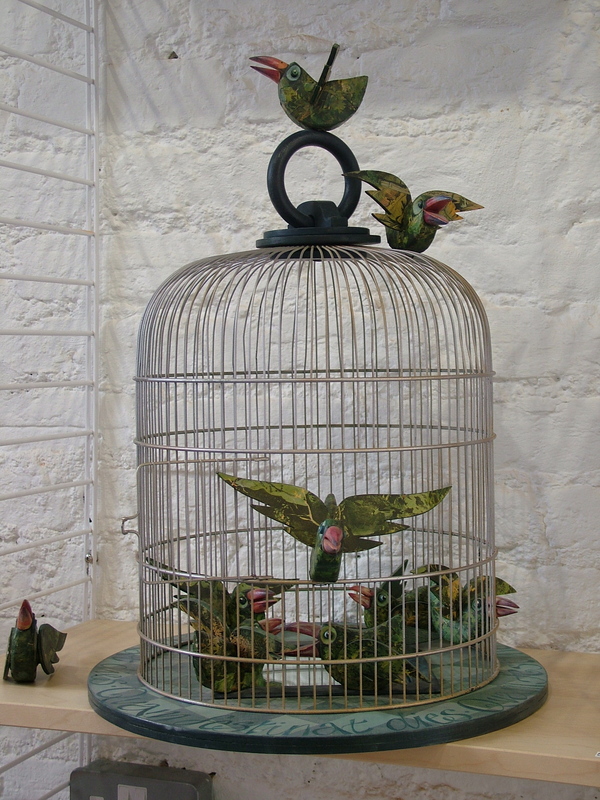 In the gallery Eleanor Glover’s birds have managed to open the cage door and are escaping into the room. 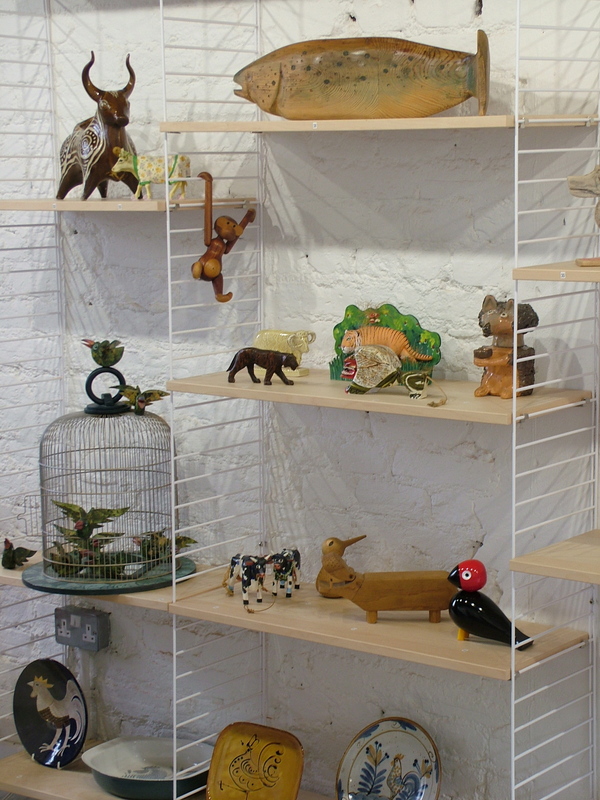 Lions roar and bulls posture while Bojesen’s monkey swings from the shelving. A blue papier maché tabby is curled up at the window keeping an eye on Park Row. On the wall is a tribute to Max, Ken’s first cat and a Sam Smith drawing of circus acrobats improbably balancing a lion and a tiger. These pieces are not necessarily the first ones you notice when visiting the collection because of their relatively small size. The discovery of a hedgehog or a seal amongst the studio pottery or on a side table always brings a smile. Brought out and displayed together the colour and energy of them is highlighted. Though some are toys and playful others are more reflective and sinister. Ian McKay’s wooden chicken stands proud but open the drawer in her side and it contains not eggs but a row of tiny trussed and roast birds. Other artists and designers featured include Bill Newland, Sid Burnard, Eric Ravilious, Peter Markey as well as a number of folk art pieces from around the world. The show is open from Saturday 28 March to Wednesday 24 June 2015 – Wednesdays 10am – 4pm or by appointment. There is a fun activity sheet for children. The recent addition to the Ken Stradling Collection of a group of automata by Peter Markey as part of the Beales Bequest has provided it with a valuable resource for students wishing to explore the area. 3D Design students from the Foundation Diploma course at Bristol School of Art visited the collection recently as part of their studies and one in particular has made good use of the opportunity to see and handle these pieces. 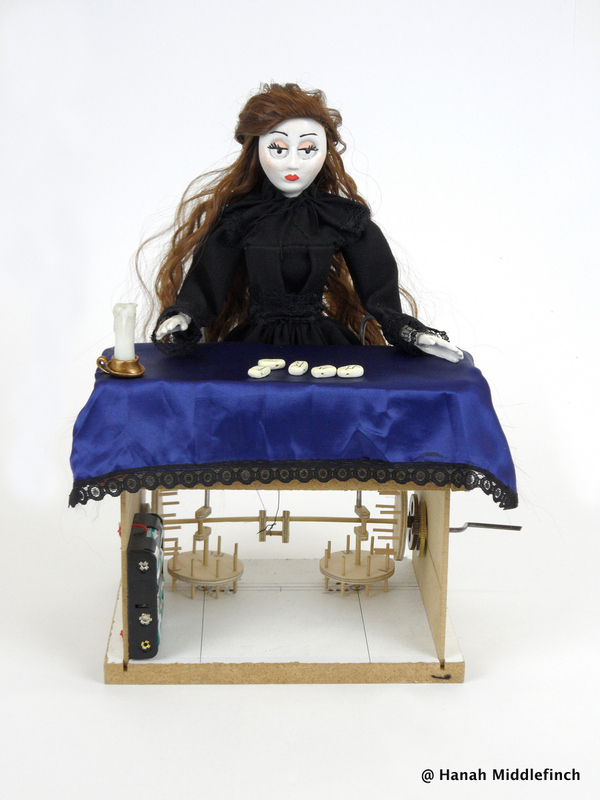 Hanah Middlefinch’s Fortune Teller has given her a few headaches and the mechanism is a sophisticated use of wheels and pins that allows the figure both to nod her head and move her hands across the rune-stones on the table in front of her. 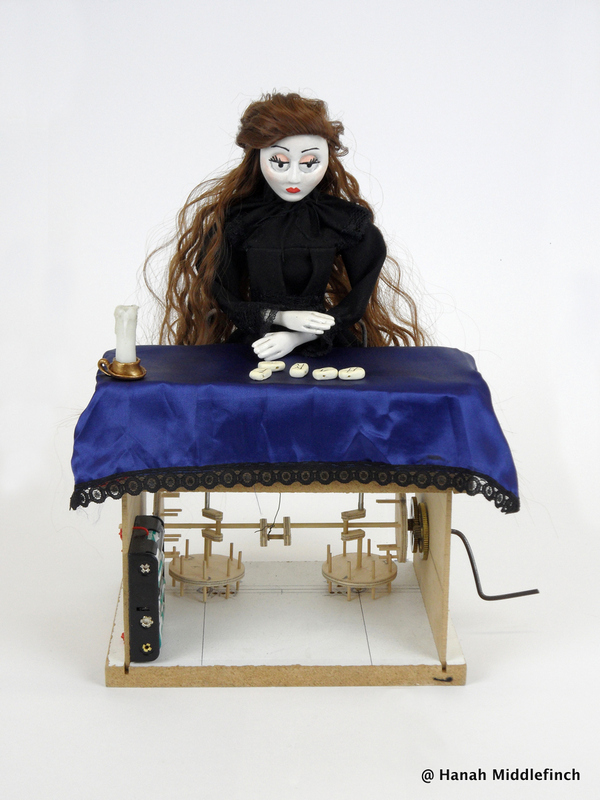 She is built of wood, mdf, porcelain and textiles and operated manually by a handle at the side. The mechanism is allied to that used for the Kissing Couple piece in the collection although more complex. The drive shaft operates a crank to rock the head and two pinned wheels to drive the hands – one to the left and the other to the right. A tricky bit of construction requiring a considerable degree of accuracy. The battery pack enables the candle to light to be lit. The Fortune Teller prepares to reveal her hand. The triple action operates the two hands and the head individually allowing one wheel l to push to the left and the other to the right. A cold gaze as the rune-stones are shown. What will they say? We wish Hanah all the best with her studies and at University next year. Amongst the collection of ceramics left to the Collection by Jennifer and Colin Beales is this delightful small porcelain elephant. It was bought from the 3D Gallery in Park Row as present for them by one of their grandchildren but we have not yet established who made it. Whoever it was was well practiced as a slab-builder, folding the shape from one thin piece of carefully cut clay. The soft texture of the clay and the matt buff/grey glaze work so well. 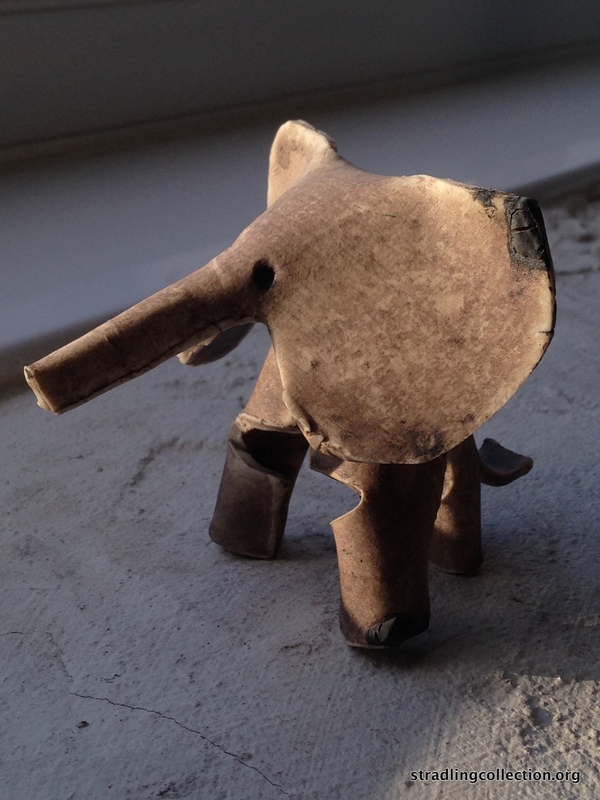 If anyone recognises our elephant and can identify the maker we would be most grateful. We would love to know what else the potter made. Go to the Collection website at www.stradlingcollection.org for more information about the Collection and for details of upcoming exhibitions and how to visit us in Bristol.